What are your plans for the summer (or if you’re in the Southern Hemisphere, read “July/August”)? It’s a simple enough question, but I want you to think about the answer for a few seconds. Do any of your plans include some kind of English studying? Studying English doesn’t have to be boring. You can learn a lot from just doing things you enjoy. Just do them in English. So here are some ideas to add a bit of English study into your summer (or winter). 1. Enjoy reading this summer — There’s no reason you should get bored! How many times have you picked up an English book saying, “Yes — I’m going to read the hell out of this book! Then my English will be much more awesome! Then I’ll read ANOTHER book! Hahahaha!”? You might have said something like that, right? But then you read, like, 20 pages and give up. But the problem isn’t you. It’s the book you’re reading. 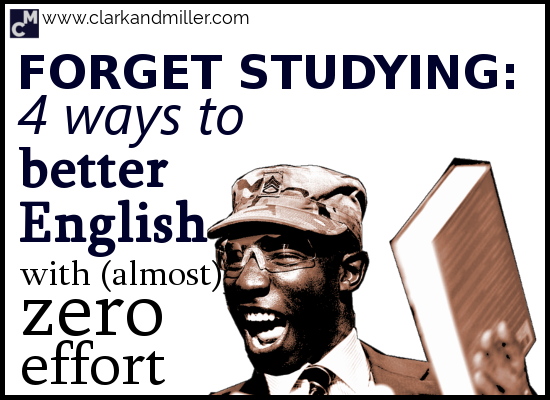 Back in February, I identified 4 reasons why you’re not finishing your books in English. has lots of small pieces of information, not one long story. Wanna have a look at some examples? Check out the post here. Some English learners have a problem, and maybe you have it, too. You’re learning English but you don’t spend any time in an English-speaking country. That makes things more difficult. So you need to bridge the gap between where you are and where all those English speakers are. Back in April, I wrote a post about how you can use the BBC’s The Listening Project to study and learn new English words and phrases that British people really use. If you really want to study hard, then check out this post and follow the instructions! But if you want to have a more relaxing summer, you can still use this very, very, very useful resource. Just go to the The Listening Project and play 2 or 3 of these short conversations a day. Have these people speaking in your living room a few times a day. IMPORTANT: You don’t have to understand what they’re talking about. Just having them talking in the background will help you get a feeling for how the language works in an everyday context. The reason I recommend this is because it’s very, very natural English and it isn’t scripted like in a film or a TV show. I know, I know. You hate writing. But that’s because you haven’t written in English for FUN yet! Terry Pratchett once said that writing was the best fun anyone could possibly have by themselves. The important thing about writing is that you shouldn’t feel any pressure. You should be able to write what you want and as much or as little as you want. Storybird is a website for creative writing. If you don’t feel inspired to write anything, go there. The beauty of this site is that you start with images (that you choose from their gallery) and then you write your story based on the images that you’ve chosen. They have fantastic image sets to choose from, all with a different mood and “vibe.” Oh, and this is all free to use. Go straight to “Create.” — There’s a lot of stuff on this site. But to work on your writing, you just need the “Create” part. Choose some wonderful art! — There’s a lot of art here, so just go ahead and choose something pretty (or weird, if you’re more like me!). Click on “Use this art.” — This will give you a choice between “Longform book,” “Picture book” or “Poem.” This is up to you. Just click! Start writing! — You can choose the pictures for each page of the book. This way, you can let the site help you with your story. Remember — the story doesn’t have to be anything special. No one’s going to see it. It’s just for you. So enjoy it! I mentioned in a very, very early Clark and Miller post that singing along to music works wonders. It improves your speaking, listening, reading, writing, vocabulary skills AND your confidence1. What’s more, isn’t summer the best time to get into new music? Back in April, I wrote about some great English-speaking (English-singing?) bands to help you enjoy learning English. Why are they so good to learn English from? The songs are repetitive, so you can hear the same grammar, vocab, phrases, etc. again and again. They’re easy to understand, so you can sing along more easily. There’s some link to culture or humour. Language is closely related to culture and I think humour is a big window into a culture. There’s use of idiomatic language. Idioms and phrasal verbs are not always easy to learn. But much easier to learn with music, right? The songs “stick” in your head. So you keep singing them. Forever. You can check the bands I recommended in that post here. But if you don’t really like any of them, then I suggest checking out Music-Map. Write in the name of a band you like. Check out all the bands that appear. I’ve discovered so much excellent new music through this site. So that’s it! In order to give yourself that final bit of motivation, tell me, in the comments, which one of these tips you plan to use. Yes. I think that the most difficult part of writing is starting. So I hope Storybird does it for you! And yes, let me know how it goes!